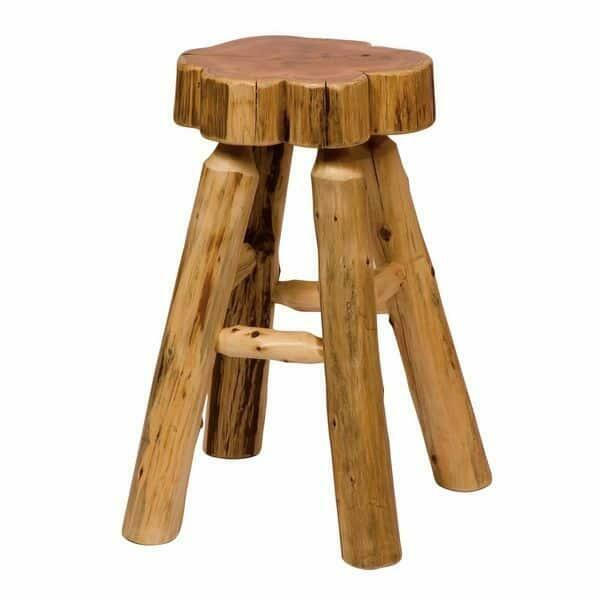 The Cedar Slab Barstool with an Inside Placed Footrest is made of Northern White Cedar that is grown in renewable forests in the United States of America. Some praise its medicinal properties and healing natural beauty, and ultimately hold the Northern White Cedar as a mystical wood. Whether it has mysterious powers or not is debatable, but there is a certain beauty about the Northern White Cedar when left rugged and natural, and that much is undeniable. Fireside Lodge takes great lengths to preserve the natural look and feel of the white cedar used to make the Cedar Slab bar height backless stool, including taking measures to handcraft each stool like peeling each cedar log by hand. Then, the cedar logs maintain their natural character, and Fireside uses only a clear coating to finish the wood, so that it’s durable but authentic. Fireside Lodge furniture has an undeniably ski lodge style appearance, but it also is built for rooms that feature rustic, rugged, Western and wooded styles.